Warner Edwards Harrington Sloe Gin is a popular Gin available from Amazon.co.uk in 70cl to buy online. Visit Amazon.co.uk for the best price for 70cl of Warner Edwards Harrington Sloe Gin or compare prices on our other Gin products. W.E use their Harrington Dry Gin with 11 botanicals; juniper, coriander seed, angelica root, cinnamon, orange peel, black pepper, lemon peel, cardamom, dried elderflower, ground nutmeg, and one secret, as the base for our Harrington Sloe Gin. The sloe berries are macerated in the gin for at least one month, before removing the fruit and adding sugar to taste, and spring water to bring the gin to 30% abv. Waste not want not! Their sloe berries are not discarded once removed from the liquid; they re-distill them to extract the alcohol absorbed, and use the resulting clear, high-proof sloe gin to intensify to sloe flavour. The finish is a satisfying warmth that makes you feel at one with the world! Try with Prosecco, bitter lemon, Champagne, ginger beer or 50/50 with Port. Where to buy Warner Edwards Harrington Sloe Gin ? Warner Edwards Harrington Sloe Gin Supermarkets & Stockists. 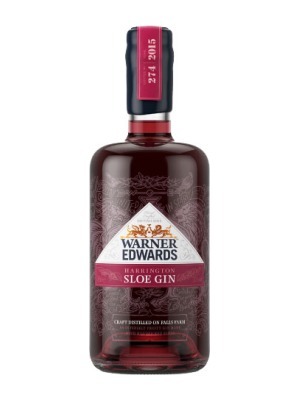 You can buy Warner Edwards Harrington Sloe Gin online in most retailers and find it in the Gin aisle in supermarkets but we found the best deals online for Warner Edwards Harrington Sloe Gin in Amazon.co.uk, DrinkSupermarket.com, TheDrinkShop, 31dover.com, and others. Compare the current price of Warner Edwards Harrington Sloe Gin in 70cl size in the table of offers below. Simply click on the button to order Warner Edwards Harrington Sloe Gin online now.